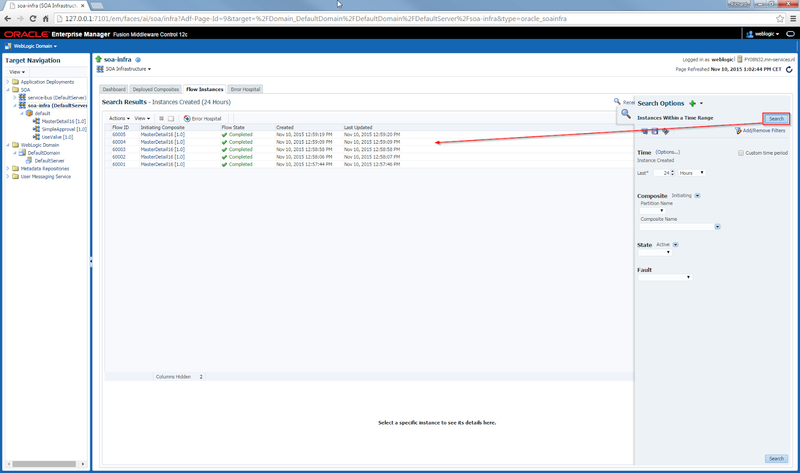 Since 12c when debugging or looking at flow instances in the Enterprise Manager, we have to use the search button to make the flow instances appear. By default the following text is being displayed: 'Conduct a search to display the list of message flows across SOA composites in the SOA Infrastructure'. Just before Oracle Open World 2015, the launch of the new 12c (12.2.1) release went public. This release was a full release of the whole stack. 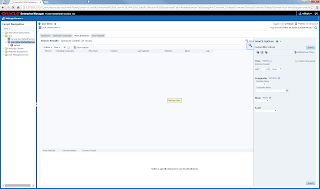 From WebLogic Server to Business Intelligence, including product that were not on 12.1.3 yet, like WebCenter. A bit closer to Open World than expected, but this was good news, meaning we can talk freely about 12.2.1 and get all the information on it that we want. Next to the 12.2.1 release, this Open World was about the Cloud, maybe even more than the previous years combined. The Cloud is inevitable and so is the Oracle Cloud, this year, personally I got more positive about the Cloud. A few years ago I was still skeptic, thought this was just a new hype, last year the Cloud still mostly seemed to exist on PowerPoint, but as we speak there are actually quiet some Cloud products live and ready to use. I do think Oracle oversells the whole story that the Business user will drag and drop and create their own applications, but who knows, they might prove us wrong there as well. None the less, even if it is not for the actual business users, these products can make the lives of the programmers a lot easier as well. A big announcement that I do want to mention again, is the Private Cloud, I think this is a huge announcement that can change the Cloud plan for a lot of companies. Here in Europe there are a lot of confusing laws and restrictions, that are different per country concerning data and the cloud. As well as there are institution who closely check what is happening with civilian data. Read more about the Private Cloud on my detailed blog post about this. Next to that I have blogged about Application Builder Cloud Service, the SOA Suite Cloud Service, and a combined blog about microsites with the help of Sites Cloud Service & Document Cloud Service. By these principles, Oracle designs there Cloud products as well. They should be easy to learn and easy to use. The line of business user should be able to use the products, not just the IT department, according to Oracle. Larry explained how a lot of there Oracle products are shipped with good security options, but they are default turned off and you have to turn them on yourself manually. Not in the Cloud, in the Oracle Clouds, security is always on. 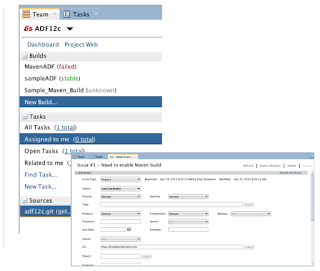 Next to the cloud, as a developer I focused on three area's this Open World, you can check out my related findings in the more in depth blogs about: WebCenter Portal, new features in ADF 12.2.1 and Oracle JET. For an overview of all my Open World 2015 blogs, check this page. 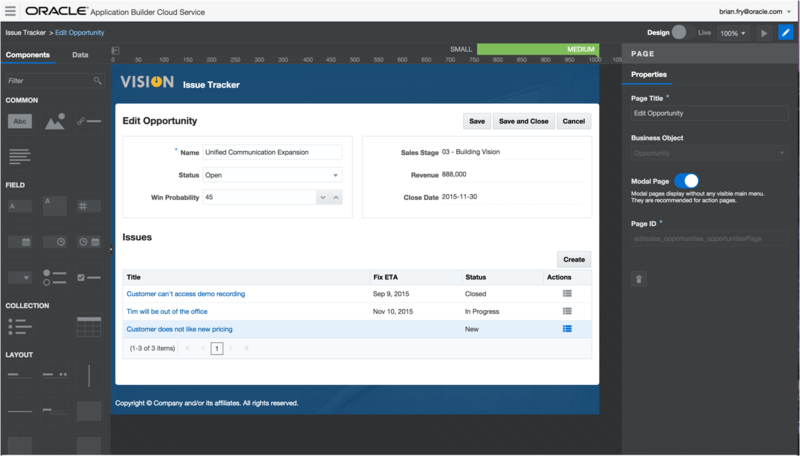 One of the other cloud announcements that caught my eyes on Open World was ABCS, the Application Builder Cloud Service. A tool for the Line of Business user to create simple web and/or mobile application by drag and drop in the web browser. Simple add components out of a menu on the page, rearrange them and edit them the way you want in the WYSIWYG editor. The tool either creates business objects from scratch in the underlying Oracle database or you can base them on a REST Service that someone has exposed. Because the application is 100% in the cloud, not only a “development tool” but it also hosts the application, there is no installation required to get you up and running. Honestly said, I was surprised by the intelligence of the tool to help the user promote their changes made in edit mode to production. At the first publication, obviously this is no problem, but what if you create database changes? The ABCS recognizes whether the change is compatible (for example, adding a column) or non-compatible (for example, deleting a column). In the first scenario (compatible changes), the abcs will suggest two options, promote to production and keep the existing production data or promote to production and promote the stage database to production as well. In the second scenario (non compatible changes), the abcs tool will warn you about the non compatible changes and suggest to export the production database to the staging database before promoting the staging database to production. The scenarios might be a bit out of the comfort zone of the average business user, but with a little help from the IT department, you can go a long way. 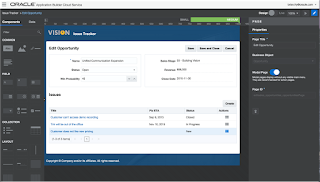 Obviously the Application Builder Cloud Service supports the Alta UI look and feel, but a nice extra feature is that this PaaS solution is fully written in Oracle JET. Next to that it also produces Oracle JET code. So if your simple application grows out to be more complex it is possible to export the Oracle JET code and have a developer work on the code to evolve this to a more enterprise like application. In other words, you can have your Line of Business user create their own prototype, making sure “the IT guys” are able to implement the application. The ABCS page is up and running, but the PaaS solution is not out on the market yet. Just as with the other cloud products, it will be possible to get a 30 days trial once the cloud product is launched. Once again I am sorry for not having better screenshots of the product. However, there is also a change that might affect you. The Portal Customization Framework as we know it from 11g does not exist anymore. 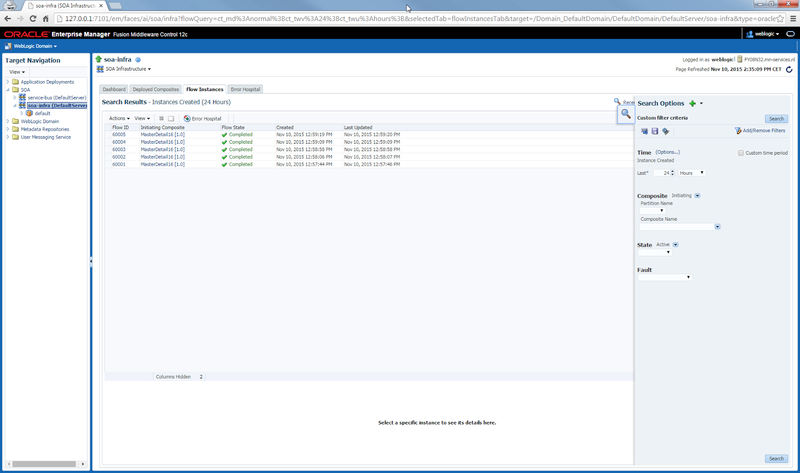 There now is only a Portal Server in 12c. This means you can easily upgrade from your 11g Portal Server to a 12c Portal Server, but if you run on Portal Framework, you will first have to migrate to Portal Server 11g before upgrading to Portal Server 12c. Oracle does have a whitepaper out on how to migrate from the 11g Framework. 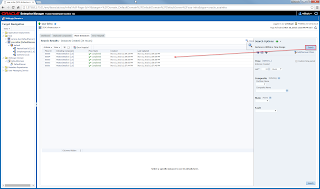 More cool stuff on the roadmap for WebCenter Portal, the product will be tighter integrated with the rest of the WebCenter Suite, as well as with some other Cloud products like JCS, ABCS, SCS, OSN, DCS & PCS. All the different search components will be replaces by the Elastic Search and there will be better performance as well as better performance analyzer tools. WebCenter Portal will remain on premise for some time, however, as mentioned there is a Cloud certification for JCS, so if you wish you can run it in the Java Cloud Services. Just as with most of the PaaS Cloud solutions Oracle now offers, you can make changes in contribute mode, they are not directly published and you can even setup an approval process before publication. You can choose whether to publish only the portal, the shared libraries, the content or also the shared assets (like page templates). 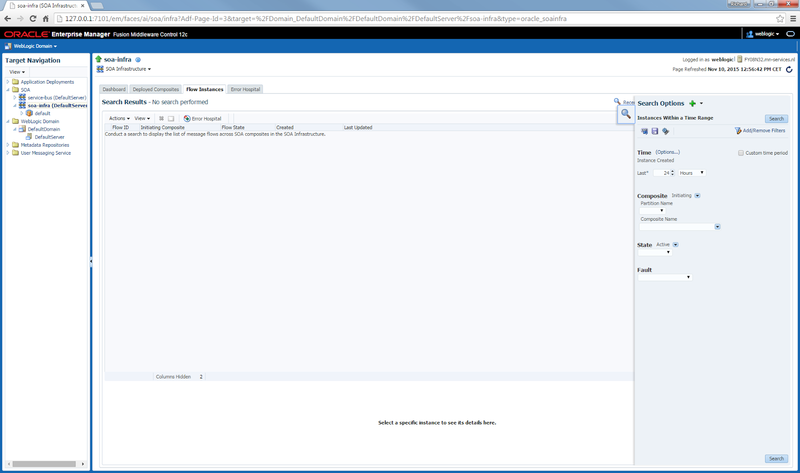 Portal still uses the Contextual Event mechanism to communicate with the ADF taskflows. As mentioned the integration with WebCenter Content is way better and you can put annotation on your documents. These annotations are stored separately in WebCenter Content and merged on the document by the viewer. 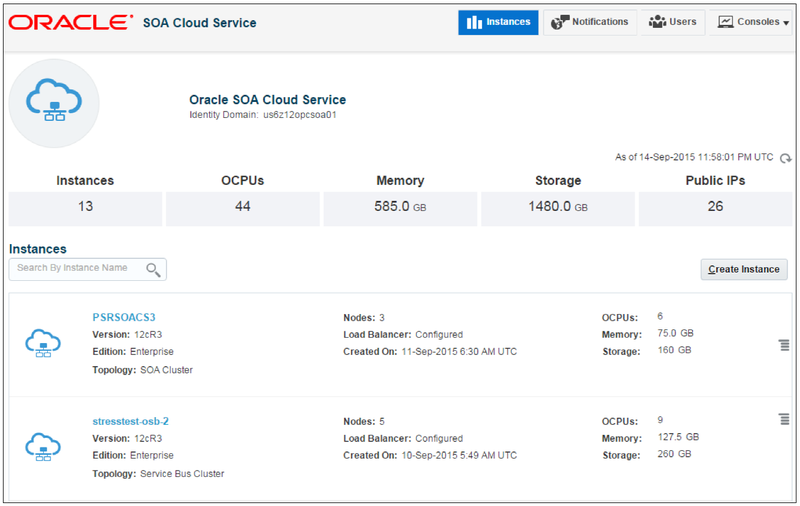 The Oracle SOA Cloud Service is online and you can check it out on the Oracle SoaCS Cloud page. This SoaCS offers you all the functionality the SOA Suite offers you on premise. In the cloud, Oracle has the same red stack strategy as they have on premise. This means the SoaCS runs on Oracle hardware and the Oracle database. This forces you to have a DbCS as well. To get the SoaCS, you follow a wizard that guides you through the steps of setting up the Cloud. In here you choose what kind of services you want, Service Bus, SOA Suite, a combination of both or the API Manager. You enter the database credentials to connect to the database in the cloud and select how much CPU and memory you want to run on. You even have control in which data center the cloud is going to be hosted. This whole wizard is based on a webservice API, so if you want you can script and automate this process. 30 to 60 minutes later your SoaCS is ready and you can start using it. 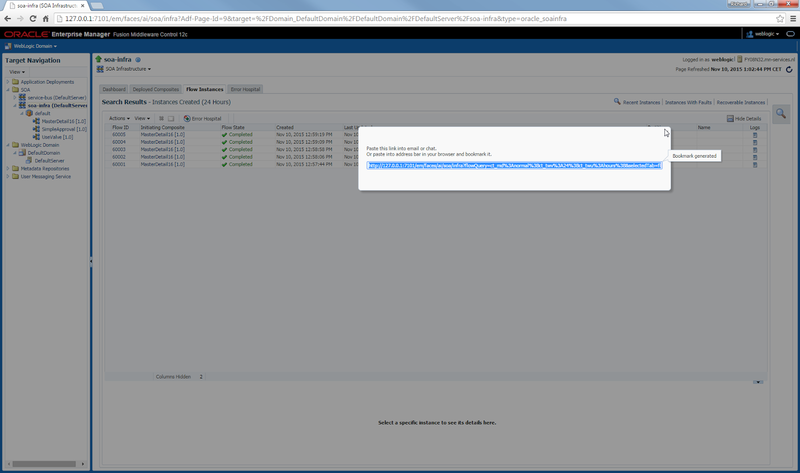 So now you got your automated provisioned & back upped SOA Cloud Service. You can connect to an on premise ldap. You can set up an ssh tunnel, not a vpn yet, although this is on the roadmap. Oracle will apply the patches for you, but you are in control whether you want them or not. There is a precheck whether the patch can be applied or not, but you cannot schedule the patch for now, you can choose to apply or to wait with it, but if you choose to apply the patch, it will be done directly. Oracle will not force you to upgrade, however, they only support the latest and the latest minus 1 version, so you cannot keep creating older versions once newer versions have come out. Off course one of the great benefits of the cloud is the scaling, so when needed, you can add a node manually. The elastic scaling of nodes is on the roadmap, but not yet there. This means that in the near future you can add rules like ‘If the CPU uses more than 80%, add another one’. You will have full EM and console access to your cloud instance. Oracle is working on a white paper with best practices, this should come out soon. But if you can not wait, you can start a 30 days free trail, you will have to go through the JCS set up for this though. Click the ‘Try It’ button on the Java Cloud page for more info. One of the big announcements this year was the Oracle Private Cloud, basicly, the Cloud will come to your on premise data center! Oracle provides the exact same service for the Private Cloud as they do for the Public Cloud. The given timeframe on the Private Cloud is early next calendar year. The interesting thing here is that Inderjeet mentioned in his presentation that the Private Cloud will have the same pricing module as the Public Cloud, this includes the hardware. The Private Cloud is a new type of rack, it is similar to the ExaLogic and build by the ExaLogic group, but it is not an ExaLogic. 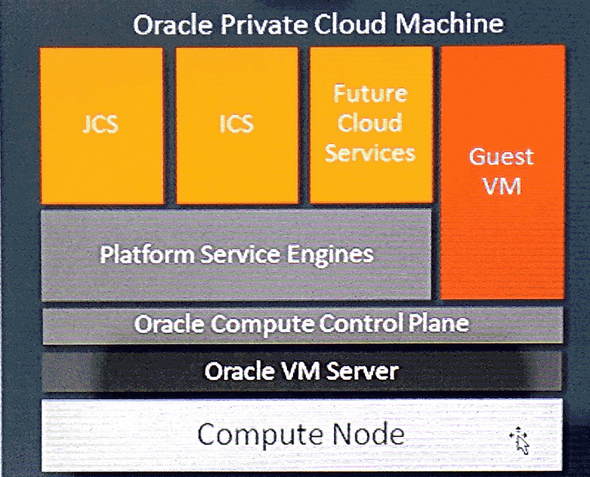 Most likely Oracle will synchronize the release cycle between the Public and the Private Cloud, this means you will get all the same features at the same time as you would in the Public Cloud. Backup needs to be done by the cloud administrators, if you want full disaster recovery (DR) you will need to either have two cloud machines in different data centers or back up to and other (on prem) data center. The whole stack of Fusion Middleware 12c was launched just before open world. This means there is also a new, cooler and better version of Oracle Application Development Framework (ADF) out! It was not too hard to follow all the session about ADF on open world this year, there were not that many to begin with. 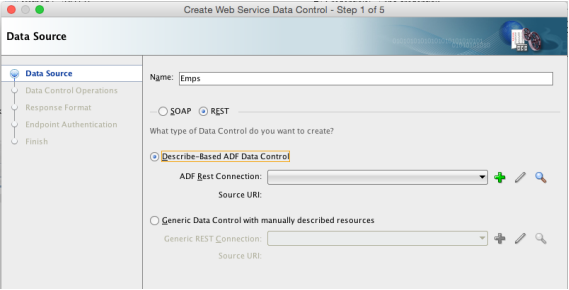 In ADF Business Components (ADF BC) there is now REST support. 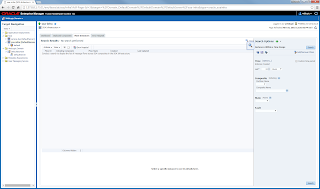 You can expose your Application Module as a REST service by simply following a wizard. 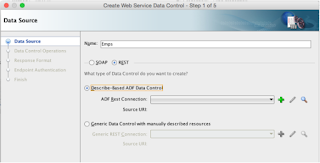 You can also consume REST services by using the REST Data Control in JDeveloper, it can consume both REST JSON or REST XML. It has a declarative approach, as you would expect from ADF and security supports for OWSM policies. On the view side, the Alta UI is now enabled by default, there is also a browser based theme editor application. 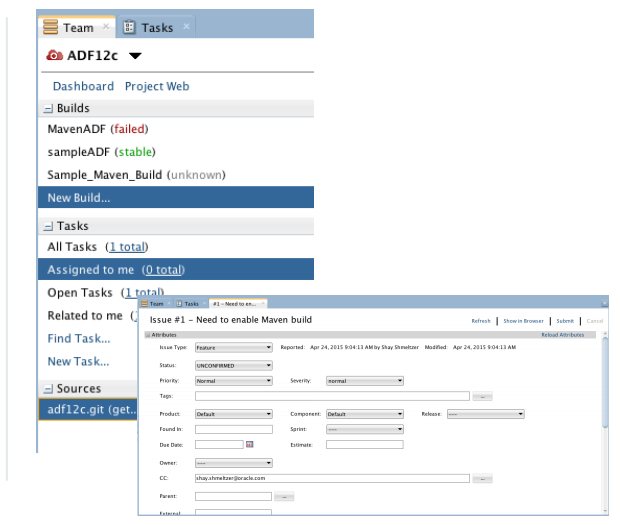 You have a visually modification of the look and feel, create ADF skins and import the jar this application create in your application to use the skin in your ADF application. Next to the skinning, there are more, better and newer Data Visualization Components (DVTs) as well! There is a cool new feature that allows you to call Remote Regions, this means that you can call a taskflow that is deployed in another application, possible even on a totally different server. Both the consuming as well as the publishing application need to be made aware of these feature. This means that you can reuse taskflows, without the need of consuming a library in the consuming application. The remote region will be loaded parallel (in the other application). You can pass parameters to the region, just like you are used to. Last but not least, ADF Faces got a lot better at being responsive! They added the so called ‘Masonry Layout’, this is not a new component, but you create responsiveness by adding predefined style classes to your components. ADF now also supports the media tag, with this you can now change properties on your ADF Faces components based on the media query results. Even more than the previous years combined, this Open World was about the Cloud! The cloud is inevitable, so it seems. During my stay at Open World, I tried to find out more about the different cloud products, including their official acronyms. To help my future self, but maybe some other people along the way, I created an overview of the clouds I met. This sure is not a full and completed list, but the once that I came across during my stay at OOW15. A visual development environment to create and host business applications. A virtual compute environment, to run your applications on the public cloud. 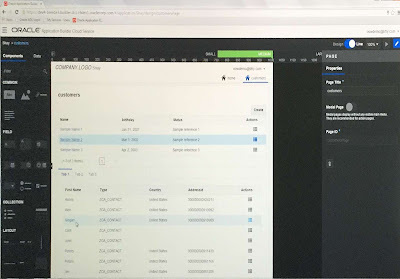 Manage your database in the Oracle Cloud! Content collaborations by an Enterprise File synchonization and sharing tool in the cloud. Your automated development platform & tools in the cloud for the development lifecycle. Visual analysis and self-service discovery, raw data to visual insights. The platform to integrate your SaaS and on-prem applications. Manage your identities in the cloud. 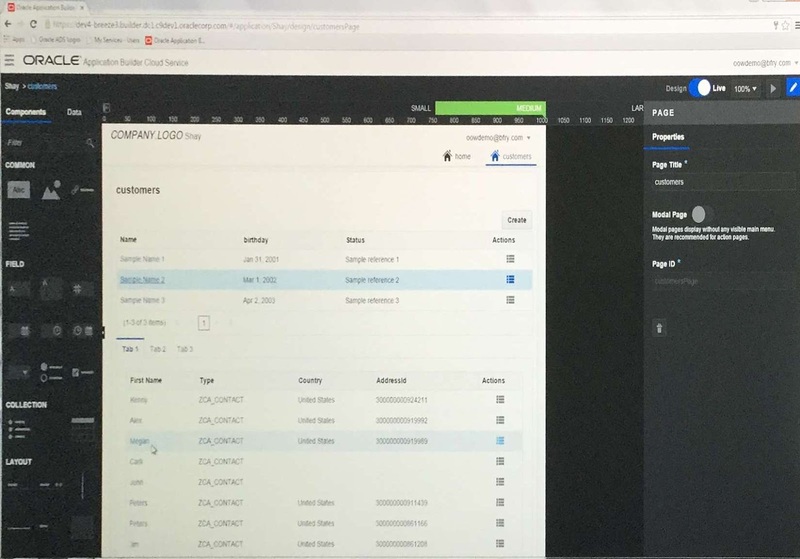 Connect and virtualize any device, real time predictive analytics. Deploy any Java application to the cloud ! Easy and secure solution for mobile app development and integration with the back end. Design, automate and manage your business processes in the cloud. Digital engagement by building rich community and marketing sites. A secure enterprise social network, integrates with PCS & DCS. 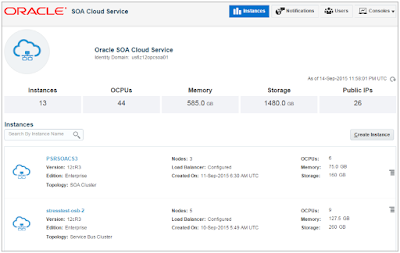 Quickly provision a new SOA platform in the cloud, the SoaCS provides you the same power as the on-prem SOA Suite. For all clouds and information on them, visit the Oracle Cloud site.